Posted 8 June 2011 under Ask Us. If I’m on birth control pills and my boyfriend ejaculates inside of me, am I at high risk of becoming pregnant? 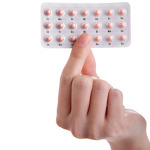 If you take your birth control pills every day, (you don’t miss any) you are very unlikely to become pregnant. That’s because birth control pills are 99% effective if taken correctly. Remember, you’re still at risk for getting an STI unless you use condoms 100% of the time.